An infectious disease deadly in deer has spread to 24 states, and experts warned that the ailment – unofficially dubbed "zombie" deer disease – could one day hit humans. 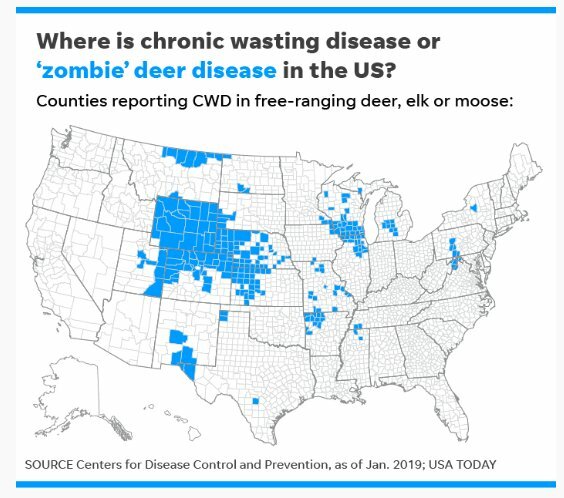 Chronic wasting disease, or CWD, has afflicted free-ranging deer, elk and/or moose in 24 states and two Canadian provinces as of January, the Centers for Disease Control and Prevention said. Last week, Osterholm testified before his state lawmakers, warning about possible human impacts. "It is probable that human cases of chronic wasting disease associated with consumption with contaminated meat will be documented in the years ahead," he said. "It’s possible the number of human cases will be substantial and will not be isolated events." Osterholm compared the situation to "mad cow" disease in the 1980s and 1990s in the United Kingdom, when there was public doubt that it could spread to humans. According to British news outlet the Independent, 156 people died in the U.K. in the 1990s because of "mad cow" disease. No cases of CWD have been reported in humans, but studies have shown it can be transmitted to animals other than deer, including primates, according to the CDC. About 7,000 to 15,000 animals infected with CWD are eaten each year, and that number could rise by 20 percent annually, according to the Alliance for Public Wildlife, which Osterholm cited in his testimony. Scientists can't say for sure that CWD will cross over and infect humans, but as time goes on and more infected meat is consumed, the likelihood increases, Osterholm said. How much of this caused by Prion-Poisoning? "If Stephen King could write an infectious disease novel, he'd write it about prions," Osterholm told lawmakers. The disease affects deer's brains and spinal cords through abnormal prion proteins that damage normal prion proteins, the CDC said. The cells collect and eventually burst, leaving behind microscopic empty spaces in the brain matter that give it a “spongy” look, according to the North Carolina Wildlife Commission. Symptoms, which can take more than a year to develop, include drastic weight loss, lack of coordination, listlessness, drooling, excessive thirst or urination, drooping ears, lack of fear of people and aggression. The disease was first identified in captive deer in the late 1960s in Colorado and in wild deer in 1981, the CDC said. According to the health agency, CWD could be more widespread than 24 states. Many state regulations are in place aimed at preventing humans from eating the infected meat. In North Carolina, anyone transporting cervid (animals from the deer family) carcass parts into the state must follow strict processing and packaging regulations. Indiana stepped up its monitoring efforts, though testing is not mandatory. Osterholm said more needs to be done in the way of testing deer meat. Though some states test, it needs to be done quicker and with a more robust infrastructure to prevent infected deer from being consumed, he said. The CDC recommended that hunters test deer before eating meat in affected areas. If a deer looks sick or acts strangely, hunters should not shoot or handle it or eat its meat, the health agency said. Osterholm said hunters should be cautious and follow state regulations if they're in an affected area. "No one is asking anyone to stop hunting," he said.